SOE's John Smedley argues that free-to-play console gaming is "a business model of the future". When DC Universe Online first arrived for both the PC and PlayStation 3 in 2011, it garnered respectable reviews (which is good) and a player base that quickly dropped off after a couple of months (which is bad). Sony Online Entertainment made the smart decision to redesign both versions of DCUO as free-to-play, and were proven right when its revenues soared ahead by 700%. What the developer didn't expect when reviewing the data afterwards was to see an uneven split of players between versions. According to SOE President John Smedley, 70% of all DCUO players prefer the PlayStation 3 version of a game readily available for free on both platforms. "It's 70 per cent of the audience," Smedley said. "Free-to-play on PlayStation 3 is huge ... In fact, right now, it's us with DCUO and Free Realms and our friends at CCP with Dust 514 that are going to prove that this market really works." 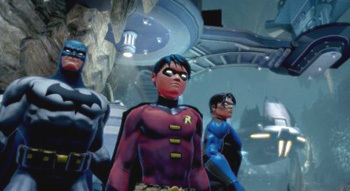 The PC is generally considered to be the MMO platform of choice, but to Smedley, DCUO's figures aren't just a quirk of statistics. He believes that, thanks to the convenience of online console stores, free-to-play console titles are becoming a huge gaming market, and the DCUO players are backing him up. "There's a lot of people that go through that store and it's so easy to find and download these games that it's a great business model," Smedley continued. "We can put out thousand of items and it feels very frictionless. The remarkable thing is with a game like Free Realms where's there's literally thousands of items to buy it has to be a solid platform to begin with to support that. It's no small thing to be able to that. It's a business model of the future." There's quite a bit of truth to Smedley's argument. Free-to-play MMOs generally last longer, obtain more revenue, and can gain a greater number of players in comparison to paid MMOs. As online-only console titles become more common, the trends seen on PC platforms will likely repeat themselves for console audiences. "Free-to-play is the ultimate of expression of a free market in video gaming," Smedley explained. "It's completely about quality, there's no purer way to see whether you have a good game or not than by saying 'this is free, do you want to play it?'"